"Has a long reach and the ability to deal a string of critical blows." Lock the Keyhole in Halloween Town. "Obtained in Halloween Town. Easy to handle with a fast recovery after card breaks." The Pumpkinhead is a Keychain for Sora's Keyblade which appears in Kingdom Hearts and Kingdom Hearts Chain of Memories. In Kingdom Hearts, Jack Skellington gives Sora the Pumpkinhead after he locks Halloween Town's Keyhole. In Kingdom Hearts Chain of Memories, the Pumpkinhead is the signature Attack Card for Halloween Town. The Pumpkinhead is almost entirely black in color. It has a simple handle, a facsimile of Jack Skellington's head adorning the hilt, and a jagged guard with thin, white veins that is modeled after Jack's bowtie. The shaft of the blade is thin and long, and the teeth resemble a stylized bat hanging from the blade. The Keychain token is a jack o' lantern. The name "Pumpkinhead" references Jack's position in Halloween Town, the "Pumpkin King". 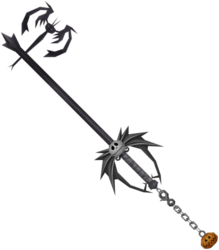 Both Jack's head and a jack o' lantern are part of the Keyblade's design. Pumpkinhead is the Keyblade packaged with the Series 3 Play Arts Figures Halloween Town Sora.